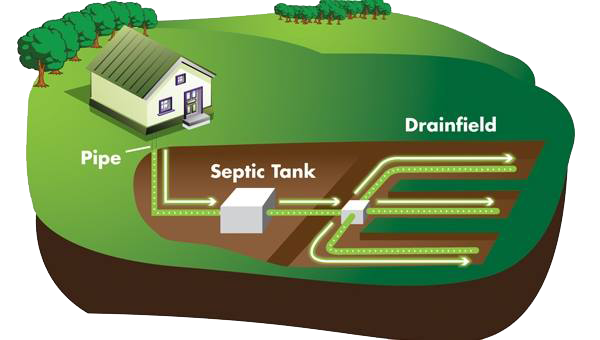 A well functioning Septic System will enhance a home’s value. You should be aware of how an existing system is functioning whether you live in the home or are considering buying a new home. Any problems that exist may not be apparent until a thorough Septic Inspection is performed. We recommend the existing or potential home owner be present. Often the realtor representing a potential home buyer is also present. The Septic Tank: We check the integrity of the tank, risers and lids for deterioration or abnormal conditions. Inlet and Outlet baffles are physically inspected for proper operation. The outlet filter is cleaned (if applicable). The Flow Test: We do a system flow test to evaluate the drain field efficiency. The Drain Field Inspection: We will dig up the distribution boxes and inspect for deterioration and the presence of any solids. We expose the leaching trenches or galley and inspect for proper operation. The Area Inspection: We check the surrounding area for any evidence of improper drainfield function, including blowouts, percolation to grade, seepage into watercourses etc. Prior History & Usage: We compile any information and history of the septic system to establish a timeline of usage as far back as possible. Full Inspection Report: We document in writing all findings of the inspection and provide a detailed report to the client.